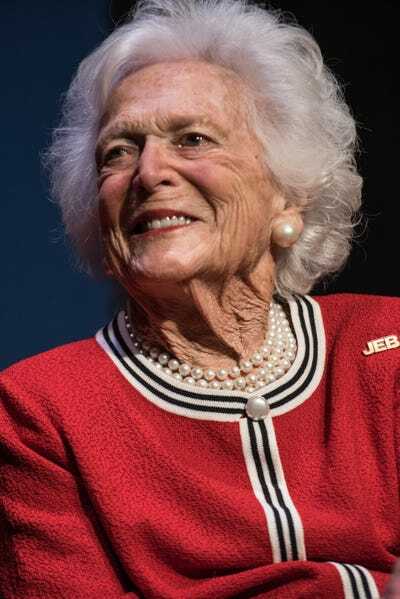 Former first lady Barbara Bush died on Tuesday at her home in Houston at the age of 92 after suffering from the lung disease COPD and congestive heart failure. 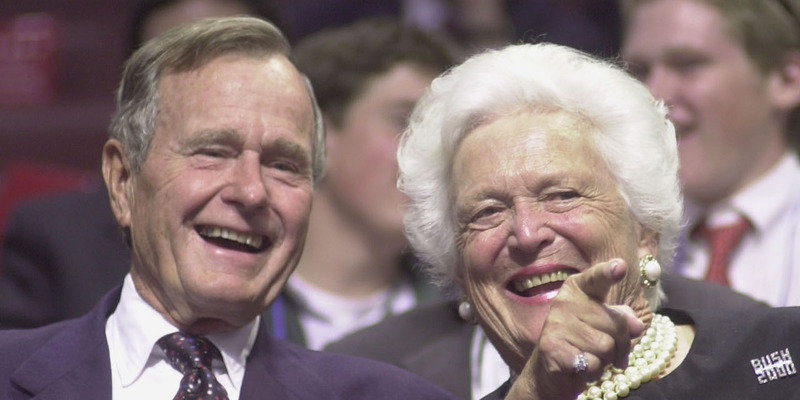 Bush leaves behind her husband and former President George H.W. Bush, five children, seventeen grandchildren, and seven great-grandchildren. Bush was born Barbara Pierce on June 8, 1925 in New York City and was a distant relative to Franklin Pierce, the 14th President of the US. Pierce grew up outside of New York City and attended three different schools before the age of 16. While at home from boarding school for Christmas break in 1941, the 16-year-old Pierce met the 17-year-old George H.W. Bush at a dance at Bush’s school in Andover, Massachusetts. The two dated for almost 18 months before getting engaged. The couple married after George returned home from World War II as a Navy bomber pilot and Barbara left Smith College following her freshman year. Barbara moved with George to New Haven, Connecticut after getting married as George enrolled at Yale University. After George graduated from Yale, the family moved to Texas as he decided to enter the lucrative oil business. Barbara and George had six children, including future President George W. Bush and Florida Gov. Jeb Bush. One of their children, Robin, died from leukemia at age three. As George began to get involved in the political world, Barbara took on the role of wife and mother. She was the primary caretaker of the five children and helped George in his political campaigns. After George was elected to Congress in 1966, the couple moved from Texas to Washington, D.C.
After George served in the House of Representatives and lost a bid for the US Senate in 1970, President Richard Nixon appointed him ambassador to the United Nations. As a result, Barbara moved with him to New York City and began getting to know and entertaining foreign diplomats. When Nixon asked George to leave his post as ambassador to the UN and take over as chairman of the Republican National Committee, Barbara attempted to dissuade George from taking the position. She believed that it would be a detriment to his political career wading into the politics of the Watergate era. Nevertheless, he accepted the position. When Gerald Ford became president, Barbara and George moved to China after George became chief of the US Liaison Office in China. It was Barbara’s first foreign trip and she immersed herself in the culture by learning the language and biking around her new home. Barbara returned to the US with the George after he was appointed CIA director. But she fell into a serious state of depression. Factors that contributed to this included the confidentiality of her husband’s new job, her children had moved out or were away at school, and that she felt that she was not achieving her goals, according to her biography from the National First Ladies’ Library. In 1980, George ran for president, and Barbara helped him out on the campaign trial. Despite losing to Ronald Reagan in the primary, George was selected as his vice presidential candidate and helped the GOP take back the White House. Sean Rayford/Getty ImagesFormer first lady Mrs. Barbara Bush listens to her son, Republican presidential candidate Jeb Bush, at a campaign event February 19, 2016 in Greenville, South Carolina. As the wife of the vice president, Barbara travelled all around the world representing the US and building relationships with foreign leaders. After her son Neil was diagnosed with dyslexia, Barbara began dedicating her time to combatting illiteracy and advocating for higher literacy rates among children and adults. Barbara helped George on the campaign trail again as he made a second run at the presidency in 1988 after serving two terms as vice president. George defeated Michael Dukakis to succeed Ronald Reagan and become the 41st president of the United States. As first lady, Barbara looked to continue her charitable work by starting the Barbara Bush Foundation for Family Literacy. The goal of her foundation was to support organisations that teach reading skills to both parents and children. Barbara also wrote a book that raised roughly $US1 million. However, Barbara and George only had one term in the White House, as Democrat Bill Clinton defeated George in the 1992 presidential election. After leaving Washington in 1993, Barbara and George spent their time living in Houston and at the summer home in Kennebunkport, Maine. Barbara continued her philanthropic work by remaining active in the Barbara Bush Foundation for Family Literacy. She also helped campaign for her two sons, George W. and Jeb, in their gubernatorial and presidential campaigns. Barbara leaves behind her husband George, five children, seventeen grandchildren, and seven great-grandchildren. She will be buried at the Bush Presidential Library at Texas A&M in College Station.